Hello and welcome to another edition of Sealed Success! This past weekend was Draft Weekend and I drafted mostly okay during the two drafts I did. I had a pretty mediocre Simic deck in the first draft because I wanted to force it, and in the second I started with Orzhov and halfway through fully switched to Simic. The first pack had pretty strong Simic signals and I took green/blue cards when I had a bad pack but it was until I started seeing cards come the other way that I abandoned Orzhov completely. In truth I was forcing Orzhov and hoping it would become open, however that was not the case and as I felt I didn't have much to lose I went into Simic. I had to splash a few white cards to make playables and went 2-2 despite Orzhov and Simic having no overlap at all. I wish I had switched earlier and it would have given me at least one more match win had I done so but that's something you don't normally see happen; you switch from one color combination to a completely different one. The key takeaway here is if you end up doing this something went terribly wrong during the draft, and more than likely it's your fault. 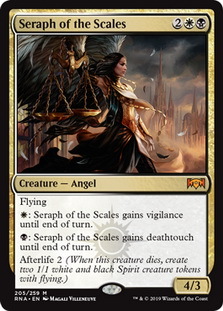 Let's say you start off in Gruul and in pack 2 you open Seraph of the Scales and you take it as to not play against it, then start looking at the Orzhov cards getting passed from your left. If you switch from Gruul to Orzhov you're not going yourself any favors and have wasted an entire first pack of picks at the same time. If you start off a draft forcing a color combination and then don't switch immediately to the open colors when you realize it's open, you've already made a mistake and you double up on it if you choose to switch later on. After a certain pick you've crossed the point of no return and need a lot of luck to make the switch worth it. I'd say any pick after your 10th pick in pack 1 is too late to abandon your colors for new ones and most certainly any pick after pack 1 ends is going to cost you. I felt this was a pretty straightforward draft as the packs told me to be in Simic and I didn't really have any reason to stray into Azorius or Gruul once I set my sights on Simic. This isn't to say this is a great Simic deck, it's just the packs were presented in such a way that I didn't see a good reason to leave Simic and abandon picks I had already committed to. I believe I had a chance at 3 Combine Guildmage which has to be a signal if there ever was one. I had concerns about maindecking Eyes Everywhere since I thought it would be best to sideboard it in in sealed games but it worked out nicely in the maindeck. The ability to Scry 1 every turn does help smooth out your draws and the threat of activating it once you have 6 mana does change the way your opponent plays the game. If you're on the offensive they have to play even more defensively as possible because they could lose a blocker at any point so they have to really commit to playing defense if that's their position. Depending on how they play offensively they might not be able to play their best creature because if they need it to maintain pressure they could lose it and it help your position defensively. I won my first match pretty easily and lost the next two just as easily which was a disappointment but it happens. I felt I ran into two bad matchups and had I run into even matchups I might come away with a 2-1 more likely than I end up 1-2. The last match I couldn't win unless I got lucky and my opponent drew badly because I don't have pressure early and they have better cards than I do if the game goes a little later than I'd like it to. I tried my best in the second game and got close to winning but I didn't have the right draws at the right time and so it goes. I don't like doing replay videos as it isn't as insightful as my live commentary but a mismanagement of time and real life circumstances necessitated me doing the videos in this manner. After the first stage I switched to Gruul with a blue splash and after the second stage ended I went to a mostly Gruul deck with a small splash for the back side of Incubation/Incongruity . 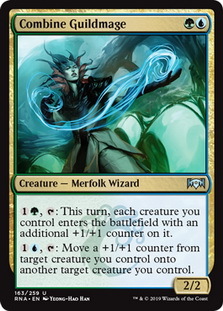 While Simic had the most gold cards I didn't have success with it and the only games I had one were the ones where I had curved out and put pressure on my opponent. I felt being base Gruul would give me the best opportunity to do this since I can combine Rhythm of the Wild and Domri, Chaos Bringer to make some potent plays. 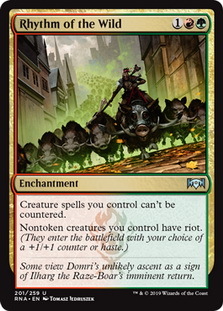 There are instances where I gave creatures Riot twice and had rare cases of creatures with three instances of Riot. This is what appealed to me after having a disappointing run with Simic and even though I still lost more matches than I won, it was a chance that was for the best. The problem with the pool and the decks I built was that they didn't have power early and the removal was a bit lacking as well. I think it's important in this format to play to the board early with meaningful plays and I didn't always have those plays in my hand or deck. My removal spells were awkward and I didn't have powerful enough spells that playing slow was the right choice to make. I generally felt I had the worst deck in each matchup and only could win if I drew the combo of Rhythm and Domri and creatures. Even though I didn't play the last round I'm going to consider it a loss and end the league with a poor 2-7 record. What do you think went wrong? What could have gone better for me? This one was actually fairly easy to break down once it was clear my blue and green weren't playable at all. The only interesting decisions to be made here are whether to be base Orzhov or base Rakdos for the deck I'm going to play the first three stages with. They're both not very good if I'm being honest, but there's not much I can do given the cards I have. 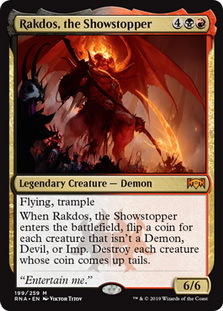 I have to play Rakdos, the Showstopper no matter what so at the very least I have that figured out. Being base white gives me more removal but being base red gives me a better chance at being aggressive. 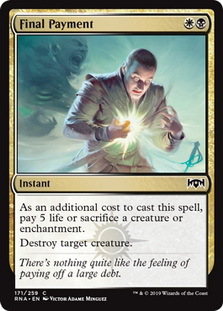 Final Payment becomes a great removal spell when I have creatures to sacrifice but I don't have much of them if I play Orzhov. What do you think? What would you play? The Guilded League didn't go the way I hoped but it's was going to be a tough out since every deck was going to be good, so I'm not surprised it ended up going the way it did. 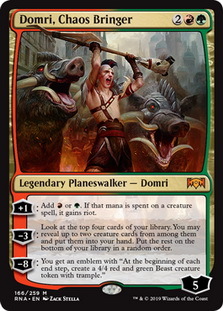 In the end sealed deck has a luck factor built in and we didn't hit the luck factor was well as I thought we did when I saw Domri, Chaos Bringer in our sealed pool. This is all part of learning the format and the losses will teach us more than the victories will. I lost a lot because my deck needed to do certain things to win and they didn't end up happening as often as I wanted them to. I needed slightly better creatures and a more aggressive slant but I didn't have those options available to me. Now I know I need to be a little more aggressive with my curves and not take "medium" hands and hope they work out.